For the past 30 or so years, I’ve done my own taxes by hand. I thought this was a good approach because it would help me better understand the practical challenges of the tax code. But it’s time to confess that I broke down and used Turbotax for yesterday’s tax return. It’s not that my financial affairs are complicated. I basically get my Cato salary and a bit of income from speeches and articles. But even that became too much of a challenge. The tipping point was the form for Health Savings Accounts. The IRS is yelling at me for how I filled out this form in past years, and I fear that I will be perpetually in their cross hairs without relying on a computer program to avoid mistakes. To help me deal with yesterday’s traumatic experience, I’m sharing some very good cartoons. 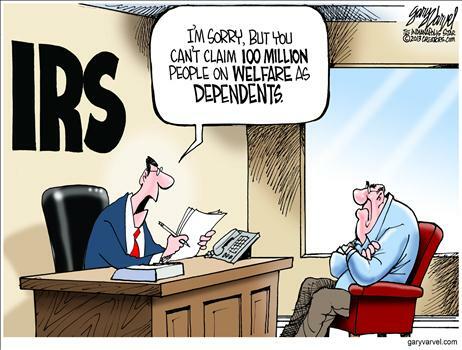 We’ll start with one from Gary Varvel. Sort of the visual version of this letter-to-the-editor. Our next cartoon, which may be my favorite of the group, is from Glenn McCoy. By the way, if you don’t think the IRS is capable of thuggery, read this horrifying story. I don’t know Paul Fell’s work, but this next cartoon is a very good introduction. 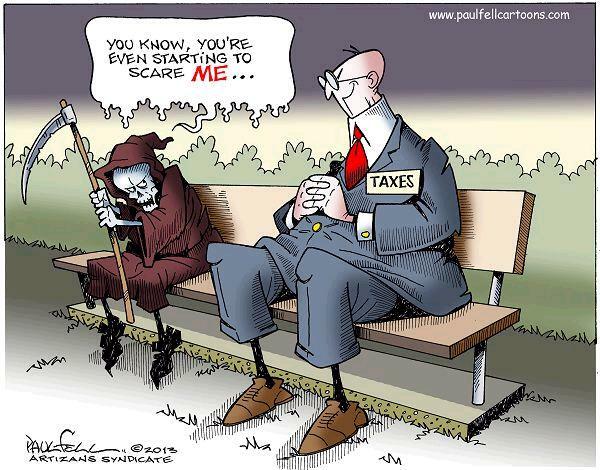 This is the second time the grim reaper has appeared in a cartoon. The first time involved the death tax. 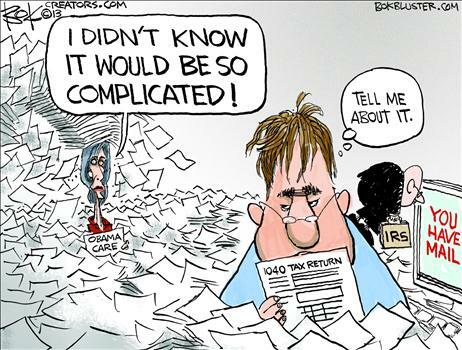 Last but not least, we have a Chip Bok cartoon about tax code complexity. As a bonus, it also features the complexity of Obamacare. 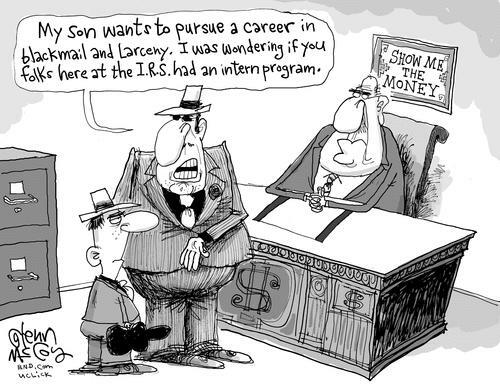 If you like cartoons that mix the IRS and Obamacare, check out this classic from Glenn McCoy and this gem by Gary Varvel. If you still need to be cheered up, here’s some more IRS humor to brighten your day, including the IRS version of the quadratic formula, a new Obama 1040 form, a list of tax day tips from David Letterman, a cartoon ofhow GPS would work if operated by the IRS, an IRS-designed pencil sharpener, a sale on 1040-form toilet paper (a real product), and two songs about the tax agency (here and here), and a PG-13 joke about a Rabbi and an IRS agent. Reblogged this on The Serenity Game.